This old church was built in 1896 and is on Old US-441 south of Mount Dora right behind a Circle K convenience store. Thousands of motorists go by every day and probably don't even notice it. It is located in Orange County just south of the Lake County line. I don't know much about the history of this church, but someone told me today that their membership is down to only 6 people. It seems a shame, because that small number of people probably can't raise the money to restore the church or keep it in good repair. Is this a part of our history that we are about to lose? 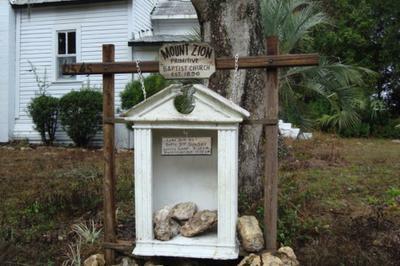 Does any visitor to Florida Backroads Travel know anything about the church? Please let us know. Maybe there is some way we can help save this old church. A friend of mine who was a Mt Dora resident for years, sent me this link. If I didn't live in Colorado, I'd be volunteering. I will be donating. We saw this beautiful church last spring while visiting the Mt. Dora theatre. So appreciative that you are volunteering your time. Currently there is a fund raiser going on GOFUNDME.COM. This has brought a lot of attention to the little church, please check it out. Before we do anything with the garden, the church must be repaired. There will be volunteers there this Saturday (November 12, 2016). My name is Lester Lane and I am a disabled veteran who is on disability benefits. I have the time, tools and a vast background in that area of work. However, I would need transportation and a place to reside in along with a power supply unit to be able to get the work done. We just learned on Facebook this morning of a new fund raising campaign to try and save this historic old church. I have been thinking for a while now to build a praying garden around this little church as a thank you to our Lord for healings. The garden will be open for folks who need prayer. I am trying to find the responsible parties for the property. Once I do, is anyone interested in this project? Can this church be opened to take photographs inside? I drove by it the other day; did not know services were still held there. Karen, as far as I know, services are not still being held there. I've never seen any activity in the building. We came in for a play tonight at the Icehouse Theatre and we saw the church right as we turned off the highway. It is absolutely beautiful and I just took a picture on our way home tonight. The sign out front has fallen down now and I really couldn't see where it was being used. I live in Colorado but my second Mama was a life long Floridian and would talk about restoring Florida's history. I don't know what I could do from afar, but I want to encourage those of you who are here to try to get it listed on the Florida historical register. Wendy, I believe this old church is owned by a private group and I haven't seen it used in the several years I've lived in Mount Dora. I have a hunch the property is zoned commercial and somebody is just waiting for another convenience store or something to come along and buy it. I try to give it a little publicity now and then hoping somebody will organize something to save it and restore it. As you can imagine, it would be a daunting task. We recently photographed this church also. It's a stunning church and the light we captured surrounding was amazing. I hope it can be saved. Didn't realize it was in Orange County. Thought it was Mount Dora. Perhaps both communities can get together to save it. I just photographed this church today, in fact, after driving by it countless times over the years. It is striking. Judy: I agree; I also hope it gets restored. I imagine one of the problems is a declining congregation. I haven't really studied the history of the church. Even though we think of it as being in Mount Dora, it's really in Orange County. Sorry, I don't know anything about the church membership. I live nearby and never see any activity around the place. Any information for contacting the church members? Isn't this the church used in Jeepers Creepers? Greg. That's a great idea. I'm going to look into what is required to get that designation. I did it once for the Melbourne Beach Pier, and it took a lot of paperwork. I think the church should be placed on the National Register of Historical Places.